MANILA, Philippines – (Updated November 2) The Professional Regulation Commission (PRC) and the Board of Accountancy released results of October 2017 CPA board exam today, November 2, 2017 or in 10 working days after the exam. The official list of passers, top 10 (topnotchers), top performing schools and performance of schools are available on this page as announced online. UPDATE: 4,511 out of 14,816 passed the exams, PRC said. PRC administered the licensure exam in the cities of Manila, Baguio, Cagayan de Oro, Cebu, Davao, Iloilo, Legaspi, Lucena, Tacloban and Tuguegarao on October 7, 8, 14 and 15, 2017. UPDATE: "The oath taking for the passers of the October 2017 CPA Board Examinations will take place in the Philippine International Convention Center (PICC) on November 27, 2017. The oath taking in the other cities throughout the Philippines will follow after the PICC event," PRC Board of Accountancy said. In October 2016 exams, results were out online in eight (8) working days after the exams. PRC named 5,249 out of 14,390 (36.48%) who have passed the series of exams. In October 2015, results were announced in four (4) working days. A total of 5,468 out of 13,317 (41.06%) passed the tests. 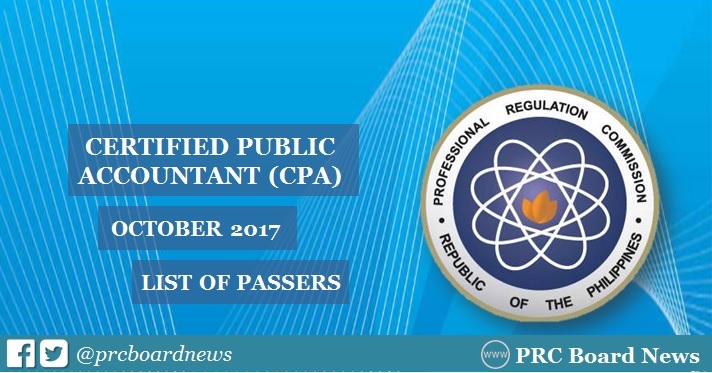 In an updated announcement on October 18, the Professional Regulatory Board of Accountancy on Facebook shared: "Due to the cancellation of government office work this week which resulted in the delay of the processing of PRC work, the new release date of the results of the October 2017 CPA Examinations will be on November 2 or 3, 2017, instead of the previously announced date of October 20/21, 2017." This is just brilliant. I found this post so useful. Anyways, I am also in need of the list of the most reputed Mobile Bar Review Courses. I have to pass this test on second attempt but not getting any recommendations for a good course. Could anyone here help? Amazing blog post,It is hard to deal with this circumstance when your vehicle got struck and battery going to bite the dust but you can get helpful site for best work. At this basic circumstance, your brain progresses toward becoming dump and proposals that come in your psyche are not work appropriately or not in this circumstance with the goal that our mind work legitimately. Yet, your perspectives are amazing. Wonderful post,Inventiveness originates from the splendid personality and the splendid disapproved of individuals has the incredible asset to use the abilities in the most ideal way and students easily get follow the link to improve their work. On this site is the case of the splendid inventiveness and I read your post which tells about the significance of the online life. Furthermore, you show impeccably what you need to pass on. Excellent post,Just a couple of individuals who win the core of the general population and franklin graham is one of them who win the core of the general population and students easily get look here to improve their work. In this post, I can see that by what method can individuals pursue the post and offer the perspective on the franklin. This is a stunning post and I like it.